SIGARRA is the Information System for the Aggregated Management of Resources and Academic Records of the University of Porto. It serves 30000+ students, as well as professors and other employees. 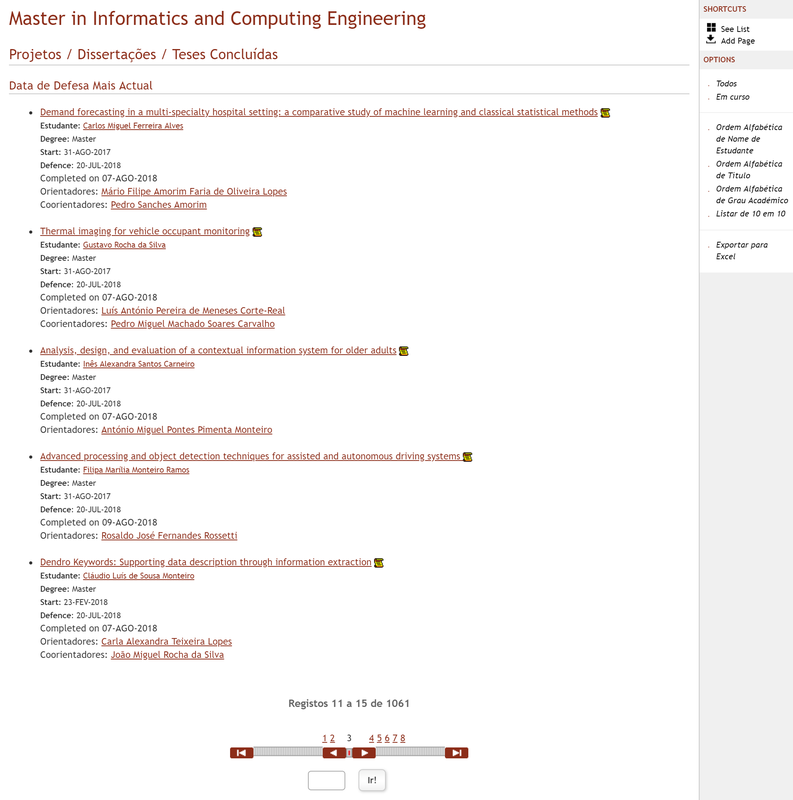 As part of my work on my master’s thesis, I sometimes consulted similar works from previous students, by accessing the list of previous dissertations of my course, available at https://sigarra.up.pt/feup/pt/teses.lista_teses?p_curso=742. However, this input field was not properly sanitized, which meant that it was possible to write malicious SQL code instead of those expected values, therefore performing a SQL Injection attack. SIGARRA runs an Oracle Database. In Oracle SQL, the > operator, when used with strings, returns true if the first string comes after the second one alphabetically. With this input, if the first char of the e-mail address of user "up201304143" has a higher value than the value of "a" in the ASCII table, then the list of thesis gets sorted by the field NOME, otherwise it gets sorted by the field TITULO. If we repeat this process using chars other than "a" we can find out what is the value of the first char in the e-mail address that we want to read. Then, the process can be repeated by appending more chars to the string in order to fully read the user’s personal e-mail address. Ultimately, this process can be automated by building a script that reads the whole field by performing a binary search. I believe this was caused by a second layer of protection in SIGARRA’s system, a Web Application Firewall (WAF) that was blocking many of my queries. In fact, a simple query such as the one above mentioned would fail, because the WHERE clause is blocked by the firewall. Therefore, I needed to change my query to something that did not include specific terms, similarly to what I described in a previous post. So, to exploit the vulnerability, I had to build a query that extracted sensitive information without using any blocked word and returning a single row and column. The problem with this query is that it does not bypass the WAF due to the use of two blocked words: table_name and WHERE. These queries return the same result, with the advantage that the latter is not blocked by the WAF. Feel free to check the documentation on Hierarchical Queries for more information on how they work, but the general idea of the second query is that it traverses the results, considering the initial entries to be the ones that have iot_name = 'CHNF$_CLAUSES' and then continuing the traversal to entries that match the condition 1 = 0. Since this condition is always false, only the root entry is returned. This allows us to bypass the block on the WHERE clause, yet still does not allow for an easy selection of a single row, because the rownum pseudocolumn is also blocked by the WAF and cannot be used as a filter. Nevertheless, more complex conditions can be defined to ensure only one entry is returned, following a trial-and-error approach. Reading a table name without writing "table_name"
Being able to filter results and limiting them to one row gets us one step closer from exploiting this SQL injection vulnerability. But we still need to find the names of the tables in the database, although the WAF disallows queries containing the word table_name. This means that we cannot directly select the column table_name from the table all_tables. To avoid this, one might try to select all columns (using the * operator) instead of specifying the name of the table we want to fetch. However, this procedure violates one of the aforementioned requirements that forces us to build queries with a single-column output. However, although the PIVOT clause is accepted by the WAF, the IN operator is blocked. Since we need the IN operator to match the required syntax for pivoting, it is not possible to use this method to bypass the WAF and read the table_name column. Having failed at bypassing the WAF using the techniques mentioned above (and others), I was preparing to give up on exploiting this vulnerability. Yet, some time later, I decided to give it another shot and see if I could come up with new ideas to circunvent the WAF. To my surprise, this time all of my queries were failing, including the ones that used to work before…​ It seemed like the issue had been fixed! Anyway, I emailed the developers behind SIGARRA with details on the vulnerability and they confirmed me that they had seen my intrusion attempts in their logs and quickly solved the issue. Therefore I was unable to exploit the system, but happy to know that my academic data is well secured.